#knickstape » What you thinking about JR? 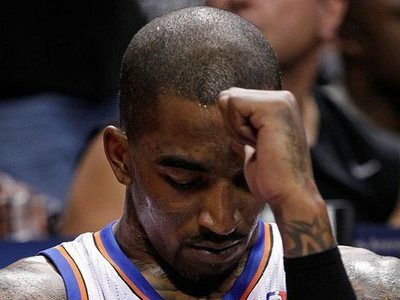 Chris Smith, the younger brother of J.R. Smith, believes the New York Knicks shooting guard will return to the team next season. JR was a key cog in the Knicks machine the day he signed with them coming from China. He was an instant Knick fan favorite, he loves NY and NY…..loves him? I’m not sure, his streaky-ness has always kept people on the fence about him. One thing that people do agree on, he is a social media time bomb. His off the court antics and attitude are the X-Factor here, I would love to see what the market predicts for him seeing that he opted out of the $2.5mil contract, he can resign with the Knicks and receive a 20% increase for $2.8mil for next year. Also there is not enough said about playingtime and the way Woodson rode JR down the stretch!